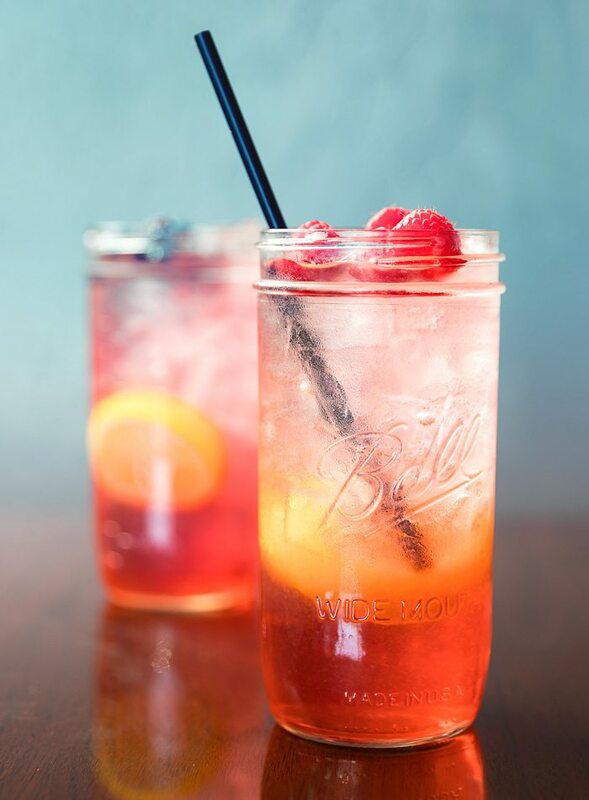 With a menu that goes far beyond burgers, Lemonade House Grille brightens up traditional diner fare with fresh-squeezed lemonades. 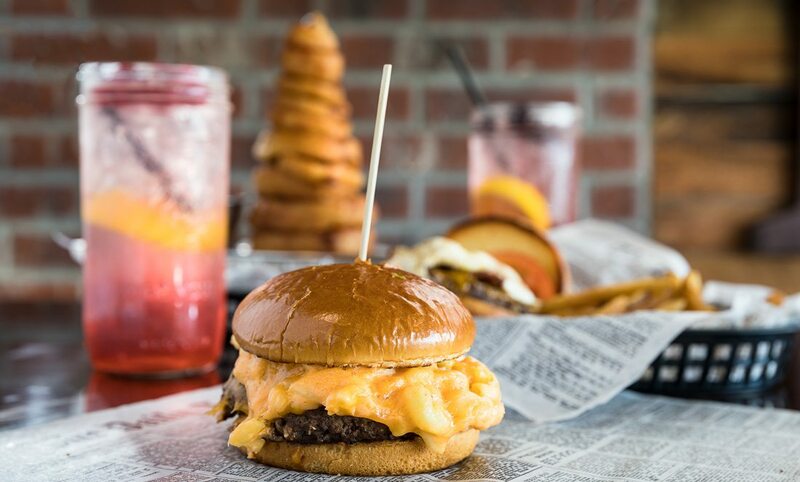 Photo by Brandon AlmsDive into diner fare with a 3-Cheese Mac-N-Cheeseburger, raspberry lemonade, onion ring tower, huckleberry lemonade or Vegas All-Nighter burger. When life hands you lemons, you make lemonade. Or, if you truly have your act together, you find someone else to make lemonade for you. So that’s precisely what I did when my outdoor plans on a recent weekend were sidelined by blustery winds and pouring sheets of rain. I grabbed my friend Maggie Sholes and headed to Ozark for a diner-inspired dinner at Lemonade House Grille (1487 W. South St., Ozark, 417-581-1955), where I planned to mourn my lost weekend with a plate of comfort food. During the week, I try to stick to a fairly healthful and balanced diet with lots of veggies and very few burgers. However, after spending a lot of time digging deep into our March cover story, “Best Burgers,” I couldn’t suppress the craving any longer. I needed a burger and fries, and nothing else would suffice. 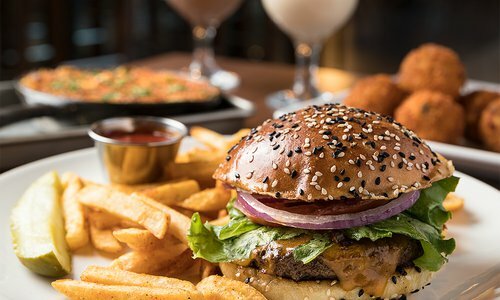 Fortunately, Lemonade House Grille has a menu loaded with handcrafted burgers running the gamut from classic, simply adorned patties to insane explosions of flavors and toppings (I’m looking at you, Memphis King burger, with your peanut butter and bacon topping). Admittedly dazzled and slightly daunted by the impressive burger list, Maggie and I needed a little time to make our dinner decision. 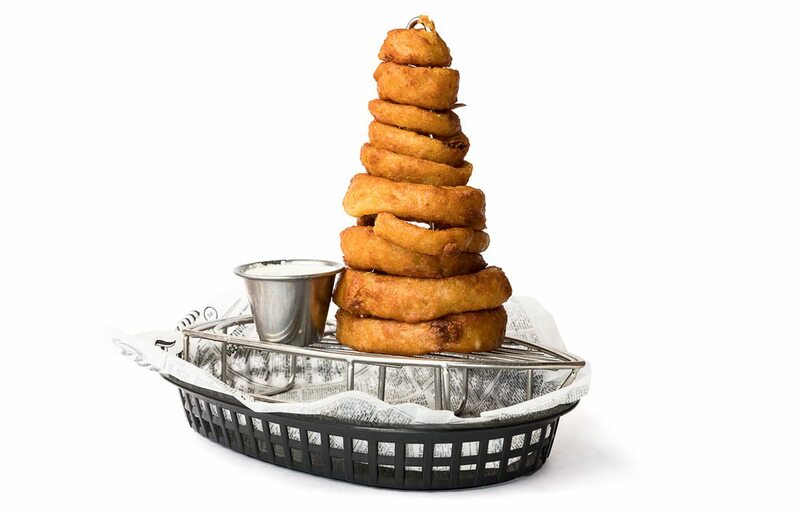 While we browsed, we ordered an onion ring tower as an appetizer. 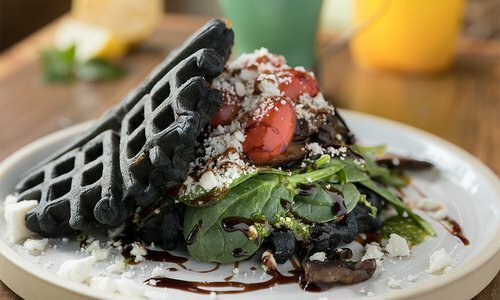 Before we get too far into this culinary adventure, I have to say, Lemonade House Grille has a substantial salad section and some tasty looking tacos for those wanting a meal that won’t turn you into a grease monster. But remember, life had handed me lemons. I was going for full indulgence to make up for it. The appetizer was huge, it was greasy, and it was tasty. The onion rings are battered instead of breaded, giving them a satisfying crunch and a less crumbly texture. Our rings had spent maybe 30 seconds too long swimming in the fryer, so they had lost a little of their tenderness, but the homemade ranch dipping sauce was bright and tangy and made up for the slight dryness. Seeing that we were at a place called Lemonade House Grille, Maggie and I also ordered lemonades from the restaurant’s huge lemonade list. (And I mean huge. There are 20 lemonade flavors!) Maggie went for huckleberry, despite neither one of us knowing what real huckleberry tastes like. You only live once, right? Liking my lemonade to be mouth-puckering tart, I chose raspberry. Within minutes we were served two pink pretties in mason jars. To my untrained berry palate, both tasted pretty similar, and both were a bit too syrupy sweet for my lemon-loving taste buds, but it was a welcome change-up from the usual cola-and-fries pairing. When it came time to order, I knew exactly what would satisfy my craving, so my eyes didn’t stray far from the burger listings. However, Maggie found herself tempted by the Urban Dogs hot dog offerings, with Instant Karma–like toppings including whipped cream cheese jalapeño sauce and mango-avocado pico de gallo. Ultimately, though, the comfort food combo of the 3-Cheese Mac-N-Cheeseburger was calling her name. Maggie’s patty came topped with super-baked, super-gooey macaroni and cheese. The pasta was the tiniest bit overcooked, making it nice and soft so you didn’t have any distracting, toothsome al dente noodles messing up each bite. Pro tip: If you save your leftovers and heat them up the next day, the butter and cheese soaks into the patty and makes it even more moist. For a little sweet-and-savory tango, Maggie got sweet potato fries as her side. To up the ante, they can come dusted with powdered sugar and served with syrup—if you’ve got a sweet tooth, this is the side for you. When it comes to burgers, I like things as close to a classic as possible—why mess with a good thing? I went for the Vegas All-Nighter burger. After having spent a few too many all-nighters in Vegas myself, I could see how this bad boy would hit the spot on a rough morning-after. Hot, greasy, oozy and comforting, the burger consists of a beef patty topped with cheddar, bacon, tomato and a fried egg. I like my eggs runny, and the yolk kept the whole shebang from being too dry. Again, keeping it classic, I stuck with the house-made fresh-cut fries, and their saltiness was a great complement to the salty bites of bacon on my burger. At the end of the night, my burger craving had been quenched, and my lemon of a weekend had quite literally been turned into lemonade. The expansive menu and inventive dishes had me curious to try even more. Fortunately, Lemonade House Grille has been franchised, and there are locations in Ozark, Poplar Bluff, Dexter, Cape Girardeau and Paragould, Arkansas. So, next time life hands you lemons, you know where to go. 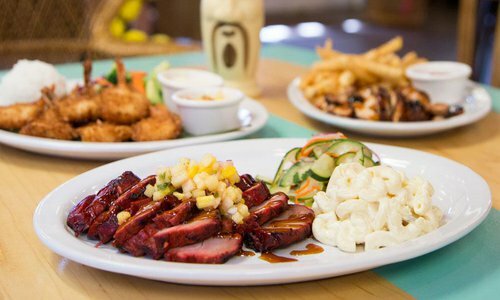 The Big Island Grill Hawaiian BBQ offers up tropical tastes with an Asian flair on a menu that’s packed with a local take on Hawaiian fare. 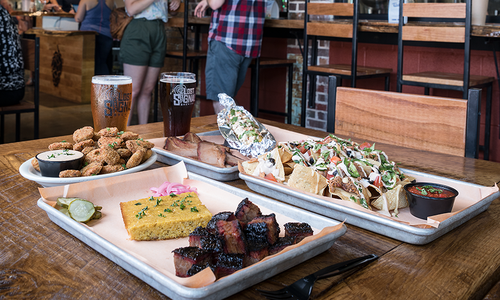 The Backlot at Alamo Drafthouse Cinema has tons of freshly made dishes and drinks on its menu. Sit back, relax and dig in.